I find myself working from home today while trying to fend off an illness whose most notable symptom is the sensation that there is a vise across the bridge of my nose. I left work early yesterday and it was all I could do to swing by the drugstore for some (to be used for legal purposes only) decongestants. I rolled out of bed this morning, made some coffee, and got to work. By 12:30 I had sent 43 emails and held two conference calls. (Remember when sick days were a thing?) The vise was tightening. I was hungry and I had failed to stock the fridge. It was chilly and gray and I had no interest in donning pants. I was going to have to make do with what I had. There was some kale from my CSA, a quarter cup of ricotta cheese that seemed to still be good, and an open bag of whole wheat penne. While I am not above making this a meal, it seemed a little sad. Then I remembered that rosemary-basil pesto I had frozen during the last gasps of summer and it all came together. Twenty minutes later, I was sitting down to a delicious lunch – and my next conference call. 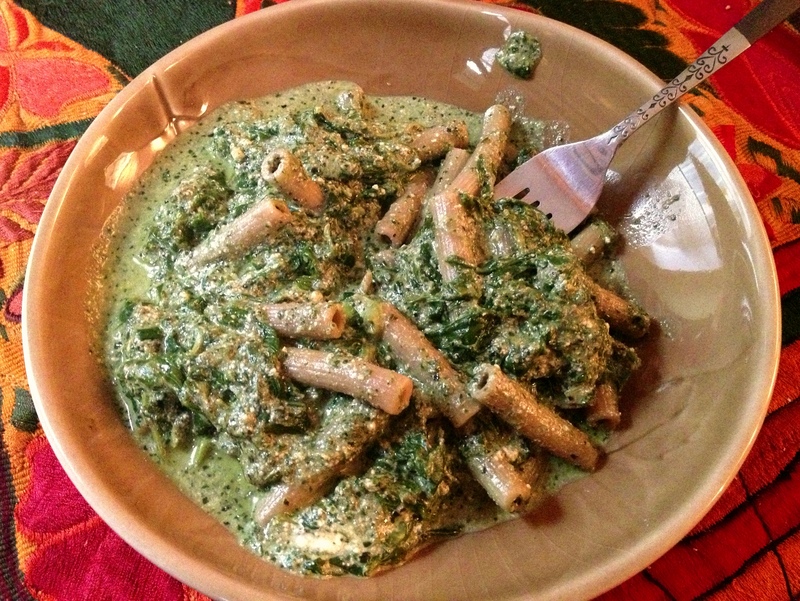 This entry was posted in quick lunch, vegetarian and tagged basil, kale, pasta, ricotta, rosemary by Jasmine Nielsen. Bookmark the permalink.